I recently had to migrate a redmine installation which gave me the opportunity to come in contact again with ruby, Plenty of my friends and co-devops seem to really love ruby. Now here was my chance to make this a slick one. At the same time I had to do some thinking concerning how to migrate and upgrade at the same time (even the order of the 2 is debatable). I decided to install the latest and greatest to get the most out of the virtual machine in the private cloud : ruby rvm + passenger + nginx + mariadb. It turned out to be screaming fast. I think rvm is awesome. Having the ability to pin a version of ruby by not having to install new packages turned out to be a good gamble. Compiling nginx with passenger plugin also is a clear winner. The performance gain over an apache oriented install was expected but it is like 3 times as fast. switching of gzip in nginx even made it faster. But it was not all sunshine. At one point I was testing the installation. We have 6 redmine plugins/mods running that need to function as before. One of them was a project plugin giving us the ability to incorporate project logic in redmine. You can view issues 'under' a project. It's concerning the Available/Selected (hidden) options section. When I change this to label_tag it shows the column names fine. To reproduce, all you need to do is visit a link like this : /projects/ /issues?set_filter=1&tracker_id=4 . Substitute project names to an existing one. This wasn't the case in redmine 2.2. And after that the 500 error went away. Below some version numbers in case you ended up here searching for a clue on that error. - a road network map. (spatialite or nominatim create databases that can be used for this). Overpass is also able to export this data. - match the GPS samples to a certain road. This is the spatial part of this exercise. The source data is easy to obtain. Since I'm only interested in the major roads I started out using an Overpass query to filter the OSM dataset. The following query gave me what I wanted. This query takes some time to finish. Splitting up the BBOX and doing it in a few turns (merging that data is trivial) goes a lot faster. See the overpass query to obtain major roads. Using this data you can create a spatialite sqlite database. I'm a big sqlite fan, in fact. sqlite is incredible. But with GIS extensions it becomes beyond incredible. Very performant too as I will show later. Use spatialite to create a road network map. So knowing we are getting a decent data feed (recent GPS coordinates), we can actually start figuring out which road segments (or osm_id's) we are driving on. (not entirely correct, we'll get to the caveats later). It's really simple: we need some kind of reverse geocoding of the coordinate. But we are not interested in address data, I want to know what way the coordinate maps to. How can we find out? The idea is still simple. I want to know how far away the point is from the 'known roadmap'. the datafeed can present me plenty of points we're not interested in, minor roads, off-road. We want to know the closest point to a LINESTRING that represents the way, more specifically we want to know the closest point of a way interpolated from our source point. Lets demonstrate. Here you see how this goes for a certain coordinate: GeomFromText('POINT(4.4447233333333 51.07015)',4326) This coordinate is represented by the partially hidden airplane which I couldn't bring to the front in QGIS for some stupid reason. The vehicle is driving on the highway. 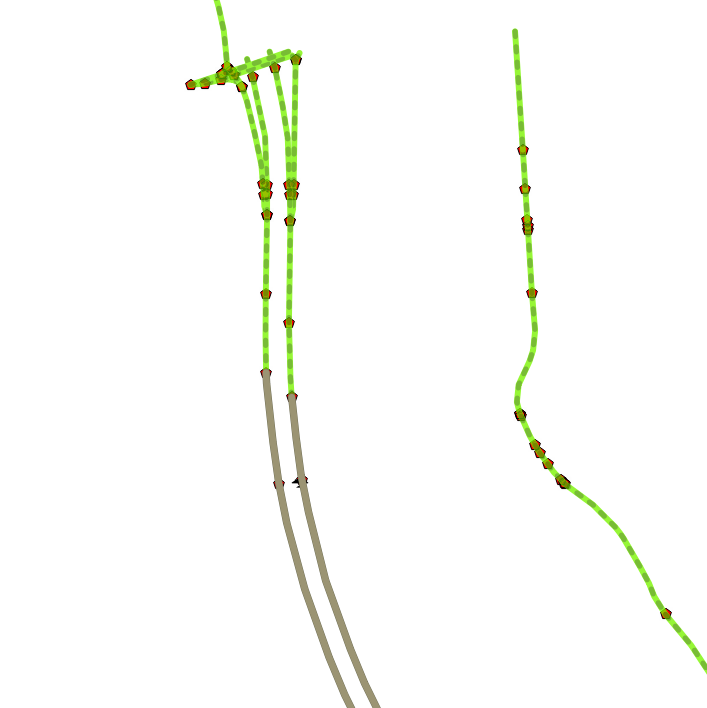 The dots represent the interpolated closest points for each 'highway' within the parameters of the query. The grey lines are the 2 closest matches. It's a perfect result. Other roads to the right aren't close enough. Lets show this without the grey lines. As you can see, the sample data is pretty accurate vs the OSM data. We'll see by how much it's off soon. 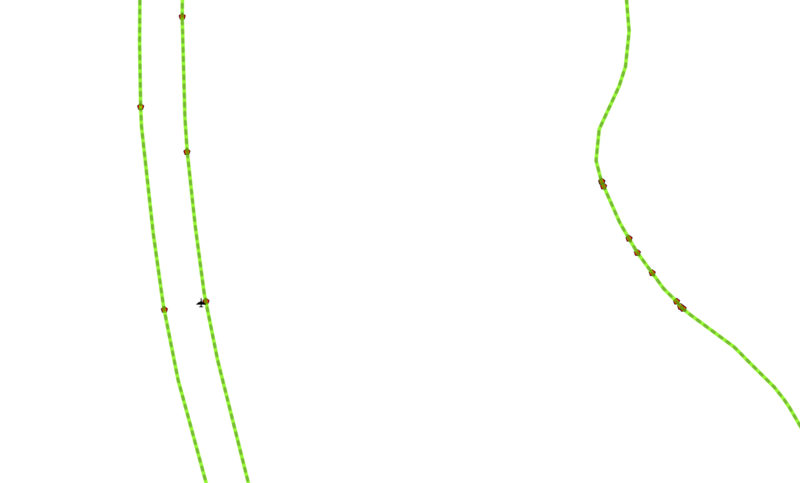 Use ST_Line_Interpolate_Point to interpolate the POI on the road. to get the closest point projected on the road. That point is the shortest distance to the way we wan't to findout. And there we go: 6.0422 meters from this road, I think it's safe to say we are traveling on that road. You could use nominatim reverse geocoding to confirm this too. But that could return a point, or a building with an address (it's made for that), we need to know the ways only. And not all of them, a subset. In fact, in nominatim postgresql database we can find out the same, we just need to create a new table to make is a tad faster. My benelux placex table is 5 million records big, this creates a subset of it. Now we have a table with only the main roads, indexed... for postgresql to return about the same answer as spatialite does, we use a different query but the same approach still stands. A few things to know, the second distance is in degrees, but us humans think in meter, hence all the conversion work is being done by 'Transform'. By the looks of it, I think postgresql pretty much agrees with spatialite on the results, both the OSM id and the distance from it. I have my limits on 15 meters, it's pretty high probably but when it comes down to GPS, you never know where you truly are without compensating for the intentional inaccuracies. Nevertheless, in this case, i'm pretty sure it's correct to say the traveler is on the E19 going north. Allright, motorway. Since we are not in Germany (yet) , there is a limit to the speed and it's 120Km/h . Perfect. Now all we need to do is go back to our GPS position datafeed, verify what the speed is of that vehicle and match the allowed speed, and mark accordingly. It's not rocket science, but then again, a single sample does't tell you that much about a road(segment). We could overlay a map with the outcome of our analysis. Or we can do some more logic in trying to build up something more solid using several datasets. Once you have enough samples, you know what goes on. But at night, we the few samples we get there we need to do some guesswork. conclusion, to visually display a traffic layer, we will need a large enough datafeed. We can use our samples to display the affected ways in a certain color depending on their availability and/or on speed conditions. Of course one would add enough statistical formula's to compensate for error margins. The data I'm using is pretty much well prefiltered. Only moving GPS coordinates will be shown. And the coordinate quality is also monitored, the raw feed has ways to verify how good a sample was, before even being considered to be used to build up a traffic layer it has to pass checks.